This spring, I planted sunflower seeds in my mom’s yard. I planted them in three places: in the backyard, alongside the driveway, and in a mostly-fenced garden area. The seedlings soon pushed their heads out of the dirt, then grew little by little. All was going well until the stalks were perhaps a foot and a half tall. They were large enough then to attract the attention of the deer who periodically wander through the yard. The deer sampled the young plants, found them to their liking, and ate the top off every plant except those in the garden area. It looked like we weren’t going to have much of a sunflower crop. The half-eaten plants by the driveway soon died, as did a couple plants in the backyard. A couple more, though, clung to life and started growing again. They eventually got a couple of feet tall, only to be eaten by the deer again. They made another comeback, were eaten again, but still wouldn’t die. Eventually the plants in the partly fenced-in garden area bloomed. The stalks in the backyard were pitiable–thin sticks waving a couple leaves, the original stem amputated and no longer growing. “I should pull them up,” I thought, but didn’t get around to it. Then, about a week ago, I was startled to see that a tiny flower had appeared on one of the side stalks. I hadn’t been paying attention, so I hadn’t noticed that a bud had formed there. The plant had bloomed in the only way that it could, off to the side, just two feet off the ground. 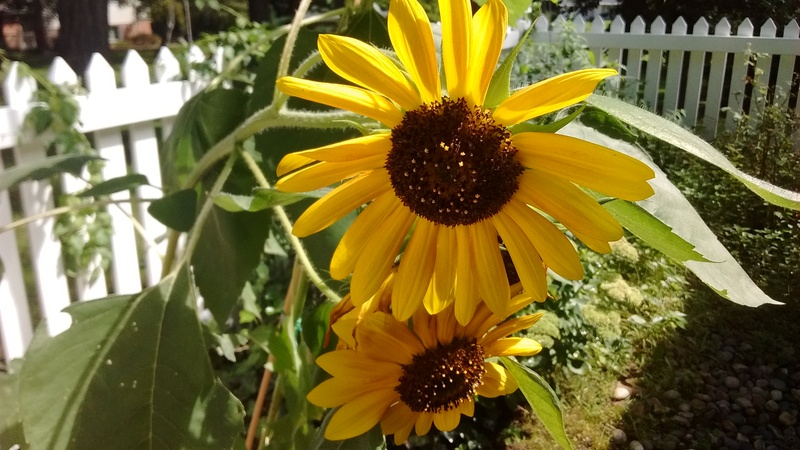 I’ve enjoyed the large sunflowers in the garden area. 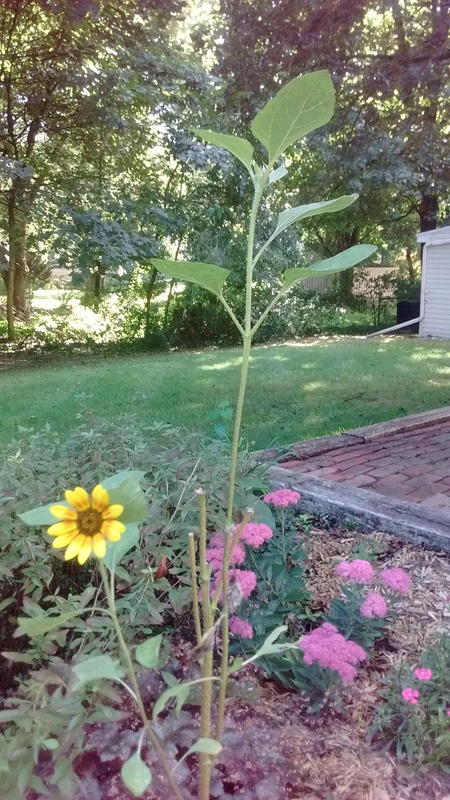 My favorite flower, though, is the little sunflower in the backyard clinging to its ravaged stalk. To me, it’s a metaphor for growing old. Most of us have spent our years not in a sheltered garden but out in the open, vulnerable to whatever misfortune might come our way. Most of us have been chomped on (figuratively speaking) at least a few times, so we bear the scars of life’s vicissitudes. We may have been tempted to give up, like some of my snacked-upon plants eventually did. But, like that stalk that eventually flowered, we started out with the potential to bloom, and haven’t forgotten that that’s what we were made for. We will never look perfect or produce blooms suitable for a magazine cover, but that’s not what matters. If we’re tenacious enough, we may surprise the world by flowering when all hope seems lost. So, don’t give up. Bloom in whatever way you can! P.S. After I wrote this, the deer finally ventured in the garden area and ate the plants there. The little flower in the backyard is still blooming. This entry was posted in Psyche, Spirit and tagged aging, elderly, gardening, loss, older adults, sunflowers. Bookmark the permalink.